Transfer deadline day saw Luton Town defender Jack Senior sign for Harrogate Town on loan until the end of the season. Here are five things you might not already know about the 22-year-old left-back. 1. Senior came through the ranks at Huddersfield Town and played in the same youth team as Premier League star Philip Billing. Senior, originally from Halifax, was snapped up by Huddersfield aged just 10 years old. 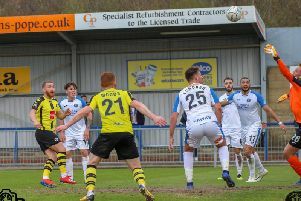 He played in the same youth team as Danish-born midfielder Philip Billing, who has gone on to make 36 appearances for the Terriers in the Premier League. Senior was later handed a professional contract by Huddersfield, but did not manage a first-team outing during his time there. 2. Senior was tempted to Luton Town by Nathan Jones, the man recently handed the task of helping Stoke City back to the Premier League. Senior joined Luton from Huddersfield in August 2016 for an undisclosed fee, initially signing a two-year deal. The man who brought him to the club was Nathan Jones, who has recently left Kenilworth Road after being offered the managerial hot-seat at Championship outfit Stoke City as they seek a return to the Premier League at the first attempt. "Nathan Jones was brilliant to work under, he's really passionate," Senior said. "I learned so much from him. He is a manager who gets the very best out of his players." 3. Senior almost became a Harrogate Town player earlier this season. Senior has been on Simon Weaver's radar for some time and very nearly became a Harrogate Town long before finally completing his move to Wetherby Road this week. A deal was all but done that would have seen him join on loan earlier this season, however with their young defender ready to head north, Luton changed their minds. The Hatters opted to keep hold of Senior as cover for their first team squad, yet 2018/19 has seen him make just three appearances, all of which came in the Checkatrade Trophy. "I was all ready to come to Harrogate and then things changed at the last minute," he said. "I was a bit disappointed at the time, but I'm excited to be here now and can't wait to get going. "I'm looking forward to having that feeling back that you get on a Saturday afternoon when you know you're going to be playing football." 4. Senior classes himself as a "defender first and foremost." Town manager Weaver has spoken about Senior's ability to "bomb on" from full-back, providing both width and deliveries into the opposition box, and the man himself admits he does like to get forward at every opportunity. He does however class himself as a "defender first and foremost." "That's my main job, to defend, and I like a clean-sheet," he added. "Anything I can do going forwards is a bonus, but I try and contribute in an attacking sense as much as possible." 5. Senior will wear Town's vacant number three shirt. Senior has been handed squad number three at Wetherby Road. The shirt was vacant prior to his arrival having been relinquished by former Leeds United defender Ben Parker when he called time on his Town playing career before Christmas. Senior is in contention to make his Town debut against Stockport County on Saturday afternoon, 3pm kick-off at the CNG Stadium.